For this edition of the Top 5 Movie Guide, with this weekend's release of "42", we decided to compile our lists around some of our favorite Sports Dramas! "42" tells the story of two men - the great Jackie Robinson and legendary Brooklyn Dodgers GM Branch Rickey - whose brave stand against prejudice forever changed the world by changing the game of baseball. In 1946, Branch Rickey (Harrison Ford) put himself at the forefront of history when he signed Jackie Robinson (Chadwick Boseman) to the team, breaking Major League Baseball's infamous color line. But the deal also put both Robinson and Rickey in the firing line of the public, the press and even other players. Facing unabashed racism from every side, Robinson was forced to demonstrate tremendous courage and restraint by not reacting in kind, knowing that any incident could destroy his and Rickey's hopes. Instead, Number 42 let his talent on the field do the talking, ultimately winning over fans and his teammates, silencing his critics, and paving the way for others to follow. It seems like this list requires some of the lease descriptors of any we've done before. This is a well-known category, and it's pretty easy to tell which movies fit into this category and which don't. Films that toe the line between comedies and dramas, "Dramedies", were left to each writer in determining their eligibility. For the most part though, if there was a sport in the movie and there were moments of drama, it seems safe to say it qualified. This is a deep category with plenty of great titles to choose from. Hit the jump to see which films made each of our lists! Always a favorite, and I've definitely watched this film more than any other sports movie. I love the characters and the relationships in the film, and still after dozens of viewings I'm on the edge of my seat for the final game. Also, the great soundtrack is a nice bonus! Probably the greatest tale of inspiration and perseverance ever depicted on film. Miles and miles of heart here, and if you don't tear up when he finally gets into the game at the end, you're not a human. Such good writing, and a great performance from Brad Pitt. Unlike the other sports dramas on this list that are based around true stories, this is one that I was actually alive during, and have a real connection to the source material. I remember the winning streak in the film and remember all the talk about Billy Beane's new approach. This was already my favorite movie of 2011 and it gets better every time I watch it. I don't even like hockey, but as we all know, the events from this film transcend sports. I know I've mentioned this when detailing this film in the past, but watching this movie makes me wish so badly that I could have been alive to appreciate these real events. I know I could have really got behind this. Well I can tell you that "Rocky" fans will hate that this film made the cut - at its core it's basically the same film (though I guess my interests in football compared to boxing won out here). 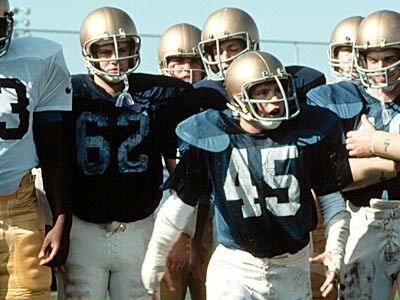 I think the pacing is perfect in this movie, and much like "Rudy", this is a story about a regular guy who just fought as hard as he could every single day to be something more (unlike "Rocky"?). This film gets the benefit of me being a Mark Wahlberg fan (though some are convinced otherwise) and being set in a time period that I always enjoy seeing in film - again, the soundtrack really brings this whole thing together. "Sure you got drunk. You have the best excuse in the world for losing; no trouble losing when you got a good excuse. Winning... that can be heavy on your back, too, like a monkey. You'll drop that load too when you got an excuse. All you gotta do is learn to feel sorry for yourself. One of the best indoor sports, feeling sorry for yourself. A sport enjoyed by all, especially the born losers." "Ah come on, Adrian, it's true. I was nobody. But that don't matter either, you know? 'Cause I was thinkin', it really don't matter if I lose this fight. It really don't matter if this guy opens my head, either. 'Cause all I wanna do is go the distance. Nobody's ever gone the distance with Creed, and if I can go that distance, you see, and that bell rings and I'm still standin', I'm gonna know for the first time in my life, see, that I weren't just another bum from the neighborhood." "Uh, Lord, hallowed be Thy name. May our feet be swift; may our bats be mighty; may our balls... be plentiful. Lord, I'd just like to thank You for that waitress in South Bend. You know who she is - she kept calling Your name. And God, these are good girls, and they work hard. Just help them see it all the way through. Okay, that's it." "You're 5 foot nothin', 100 and nothin', and you have barely a speck of athletic ability. And you hung in there with the best college football players in the land for two years. And you're gonna walk outta here with a degree from the University of Notre Dame. In this life, you don't have to prove nothin' to nobody but yourself. And after what you've gone through, if you haven't done that by now, it ain't gonna never happen. Now go on back." "This has nothing to do with winning; if those boys do their best and fail, I'll still be proud, but if they don't give it their all and I don't give them mine, then it's my failure and my disgrace. In fact, that's exactly what happened to Tommy's brother. You saw that tape? I was the coach of that team, Ms. Wade. And back then, I didn't have the heart to give them rules and drive them to the edge to the point where they hated my guts! Tommy's brother died because I failed; he was not prepared. And I will never let that happen again, EVER!" How do you watch this and not pour tears of joy at the end? This perfectly toes the line between a sports movie and a romance movie. It really was built to please everyone... except cynics and "Network" (1976) extremists. So many emotions in this movie. One moment you're tearing up, the next you're cracking up. I guess that's why they call it a Dramedy. Dramedy still qualifies under this category, doesn't it? Great characters and performances all around. You'll find some of Tom Hanks' best comedic work in this film. And to stay on target with the category...some of his best dramatic work as well. I've always enjoyed snuggling up with a cozy blanket and falling asleep to this movie. It has such a soothing background quality to it. Plus I really like Toby Maguire. I'm not even into biking and I love this movie. I'm surprised a remake was never made during the height Lance Armstrong's career. This takes place in Bloomington, Indiana, but if you were to replace the Rock Quarry with a Kraft Foods Factory it could easily take place in our home town of Champaign, Illinois. I think this might be the first list I've compiled where every film on here has made me tear up. I think that's the key aspect of a great sports movie, that it can bring that emotion out in you. That's the beauty of sports; they bring people together hoping that their team can do great. When that team or athlete achieves that greatness, there's few feelings in the world like it. I'm gonna do something a little different than include descriptions for the film - I'll instead list the moment I teared up. Moment I teared up: "Yo Adrian, I did it!". Greatest line in movie history? Definitely one of the top two for me. Moment I teared up: Multiple times, but obviously that final game when he gets on the field; gets me every time. "Who's the wild man now?" Moment I teared up: The scene in the hospital after Gary has been paralyzed where Julius is talking to Gary about growing old and fat together. Moment I teared up: Last round of the final fight. Who would've thought this movie would be so good, and it gets better and better each time I watch it. Moment I teared up: The final match. Yes, wrestling is scripted but these guys put their bodies through hell, and I have a ton of respect for them. While compiling this list, I realized that these are all movies that I can and will watch anytime, they’re just that good and their watchability is so high. This was a childhood staple of mine. I love the ethereal sort of fantasy element to it. This man turned his family's life upside down and still had their unwavering support. There's a great father/son element to this film. Ray Liotta’s piercingly beautiful blue eyes and haunting, ethereal presence is just one of the reasons that the baseball in this movie has a “more than just a game” feeling. From the beginning credits, this movie definitely has a magical feeling and inspires chills throughout. I love Kevin Costner’s Ray Kinsella and his incredulous respect for the game and the players. This movie means something wholly different when you watch it as an adult. My entire family didn't sit down all together to watch movies that much, but this is one that we could all agree on. The soundtrack was popular in my house too. Based on a true story with the backdrop of a newly integrated Southern school, the odds that these players and these coaches overcame in order to be successful as a team, together, will never get old. Look for a bunch young faces here that you’re sure to recognize in later work. This movie had a great many up and comers. This movie has an interesting hodgepodge of a cast and it’s intriguing because it’s inspired by true events and because it concerns the All-American Girls Professional Baseball League. The setting of this movie involves World War II and its direct link to the floundering Major Leagues while the boys were off at war. This girls’ league was started to make money, but of course it ended up being a lot more special than a way to fill seats. Tom Hanks plays a lovable drunk and his “There’s no crying in baseball” quote is one of the most famous of all time. I have seen this movie far too many times to count and I cry every single time at the end. How could you not? This film is the ultimate in determined underdog stories and the final payoff is huge. Rudy had to overcome so much doubt, even by his own family members. Sean Astin is amazing as a devoted Notre Dame fan whose goals are set so high, but backed up by his hard work and fighting spirit. They did a great job making this film look as though it was made in the 1970s. I realized that I always thought this movie was a lot older than it was. I watched this movie at a sad time in my life and even though I had no apparent commonalities with Mickey Rourke’s comeback as a washed up old wrestler, this movie struck a chord with me. It's heartfelt, but not in a forced inspirational and cheesy way in which other sports movies are wont to do. There’s some tough scenes to watch, but this movie is totally worth it. There we have it, folks. Overall, another great variety of films, with much less cross over this time around than on our last edition. Fifteen different films appeared above, but a few films still managed to stand out from the crowd. "Rudy", which also grabbed one first place vote, was the lone film this week to appear on all five lists. We had nothing with four votes this week either, so "Rudy" really stands out as a fan favorite. Quite possibly the quintessential sports flick, capturing the very spirit we all look for in a film of this nature. If you want drama and emotion in your movie choice, you won't go wrong here. Otherwise, four other films received multiple picks this week. Two earned three selections, "Remember the Titans" and "A League of Their Own", while two others earned two, "Rocky" and "The Wrestler". All great selections here that you can't go wrong with. Nice to see that all four focus on a different sport too, so there's a nice bit of variety there depending on what sport you might be in the mood for. An interesting detail to add to that: scanning the various sports represented above, everything from football and baseball down to pool and horse racing is represented, but there isn't a single film centering around the game of basketball. Who knows the exact reason why, but regardless, no film based on that sport has stuck with this group.